Chinese New Year is almost here. This Thursday, 2/19/15, marks the beginning of the Year of the Goat. Or Sheep. 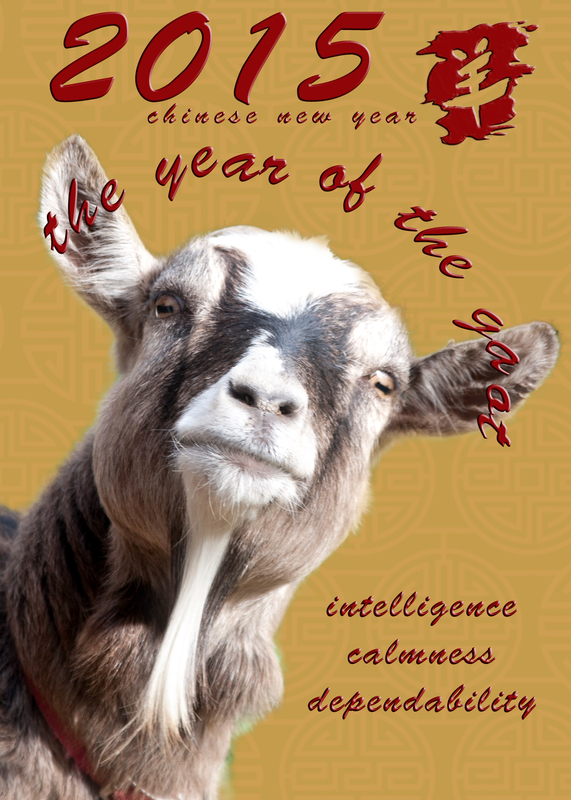 It’s actually the Year of the Ram, but male goats and sheep are both rams, so folks go with one or the other. For us, we like both sheep and goats. But goats have a special place in my heart. They’re so darn… goaty! The goat in our photo lives at Burleigh Manor Animal Sanctuary in Ellicott City, MD. She’s not even a ram, her name is Lily and she was rescued over a year ago, now living peacefully with the other goats at the Sanctuary. But HEY – why can’t it be Lily’s year too? We say, all goats and sheep deserve some love. Want to celebrate this festive holiday? You can join into the tradition, even at home and even without a goat friend! There are many cool traditions: Wear all red on the 19th to welcome good fortune into your life. Don’t sweep your home or business – you may sweep out good luck. Live in a major city? Many have huge parades and festivals to celebrate Chinese New Year, including New York, Washington DC, Los Angeles and San Francisco. Don’t be deterred by the cold – dancing dragons are amazing! Planning to stay in Thursday? 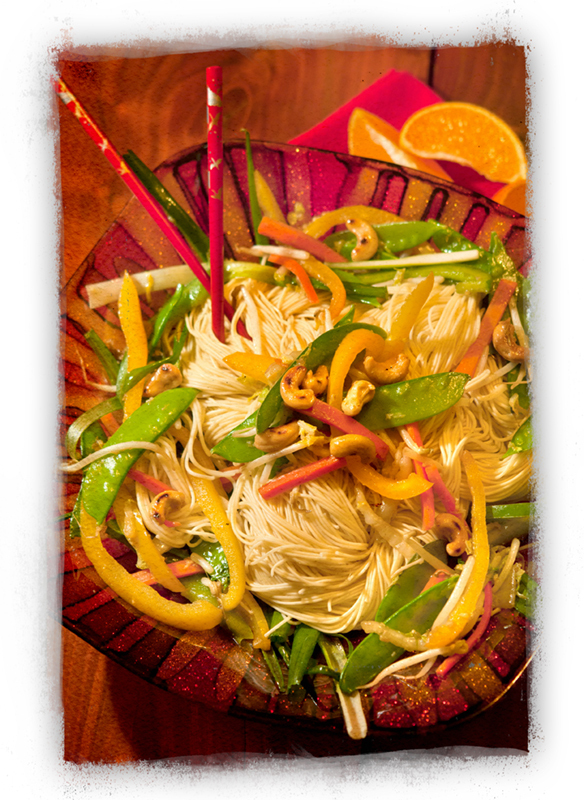 Try our recipe for Chinese Long Life Noodles with Stir-Fry! Many foods have special meaning during the Chinese New Year as well. Long noodles are usually hand made in Chinese families from wheat and water, but we’ve found many varieties at nearby Asian markets and even area grocery stores. The meaning of long noodles is to wish your friends and family a long life. So the longer the noodles, the longer life you are bestowing on them. Cabbage represents prosperity; scallions, closeness; peas, unity; carrots are for good luck and cashews represent gold bars. So as you can see, by serving this meal to your loved ones, you’re basically wishing them the most wonderful year ever, which is as it should be for the Year of the Goat! When you’re shopping for noodles, try the Asian section of your local grocer. You can use rice or wheat noodles, and most Asian noodles cook in much less time that Italian pastas. We tried two varieties, and both cooked in less than four minutes! Be sure you don’t overdo it, the noodles get chewy. If you have a local Asian grocer, you may be able to find freshly made long noodles around Chinese New Year, which are a special treat. Wishing you a very lucky, healthy and happy Year of the Goat! After 20 years of eating plant-based food, I can truly say that protein analogs – ie, veggie burgers, ground meatless, chick-un and the like, have come a long way in general. But we both feel that Beyond Meat does it the best. There’s a lot of love around here for Beyond Meat. Not only did we win a free year of their product in a Twitter contest back in 2013, but we happen to really love the stuff they make. They don’t pay us to say that, we really think so! So when they told us they were doing a BURGER, we knew it would be the BEST DAMN VEGGIE BURGER EVER. After all, their chickenless strips and beefless crumbles are so delicious, with nutrition to back them up. Today these made their first appearance in the Baltimore region at a local Whole Foods. Where they sold out already. We were lucky enough to sample this last fall. (I know, I know – so unfair!) But when we found out this beauty was available, the Dirty Hippie went tearing out of the house like a man possessed. Yes, it was indeed sold out less than one hour before he got to Whole Foods though. 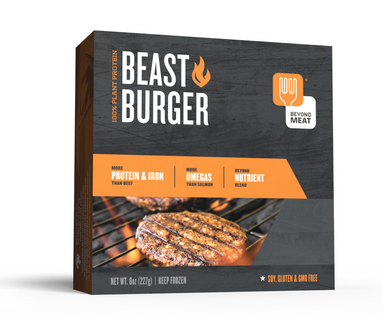 The Beast Burger has more protein and iron than beef; more omegas than salmon; contains calcium, antioxidants, B-6, B-12, C, D and E; aids in muscle recovery for athletes and is Gluten-Free, Soy-Free, Cholesterol-Free and Non-GMO. But wait – there’s more. It also TASTES AMAZING! When you’re cooking the burger, the smell is intoxicating, it’s like you’re back at your momma’s house and the whole family has come by for a BBQ. 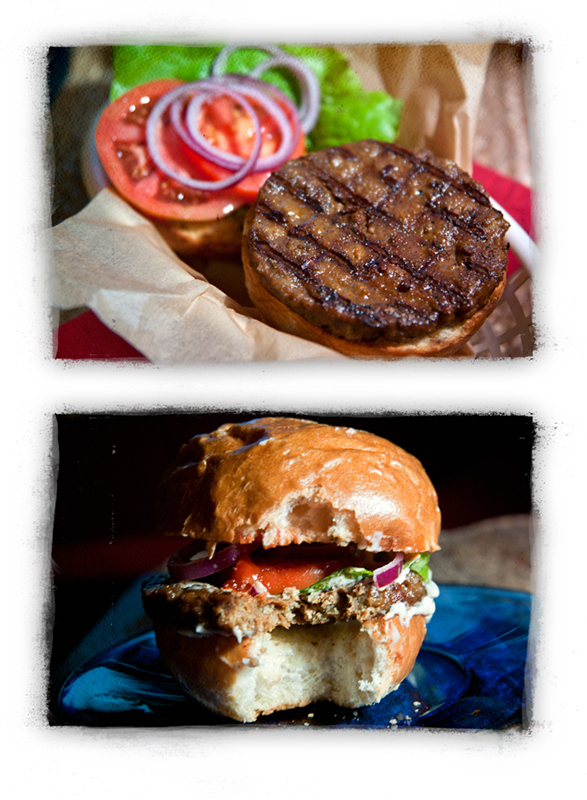 There is a lush mouthfeel, and a level of moisture that most veggie burgers miss (unless you drown them in cooking oil). It stays together in the pan and on the grill – no sad little crumbles. 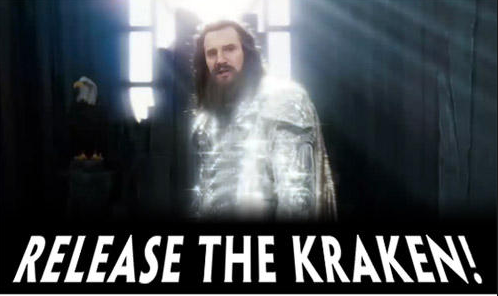 Okay, the Beast Burger is NOT scary like the Kraken and will not require a flying horse to tame – but it’s presence is just as epic. People on the West Coast got this jewel first. They keep calling it a “game changer.” And it is. For so long, the vegan, plant-based world has taken bad raps because veggie burgers tasted like paper, or were so dry, or were made of weird soy isolates that scare people, or contain wood pulp as fiber, or have crumbly textures. Whatever!! Those days are over. Beyond Meat has created a vegan burger that sets a new standard for all others. I would serve this to ANYONE – my Dad, my brother, my grandpa. You guessed correctly if you said none are vegan or even all that into vegetables. The males in my family are burger guys, and I simply cannot wait to bring this to the table. In fact, we encourage you to bring this Beast to your table. Find this amazing burger now, near you! Gnosis Raw Chocolate is definitely in its own category. This is the stuff. It will absolutely wow your Valentine. Made by hand in New York City, they offer TWENTY vegan, raw, organic chocolate bars. It’s quite an impressive array – and the flavor, texture and creativity are equally impressive. We tried three kinds: Fleur de Sel, PommAcai and Mayan Heat. Because the DH adores spicy food, Mayan Heat was first up. For those who like their chocolate HOT, the Mayan Heat bar pulls no punches! Gnosis combines spices and herbs into cacao to support and quicken the heart and circluation. Cayenne increases metabolism and helps to open the heart, and warm you up during the winter months. Chipotle, cinnamon and nutmeg round out the spice in this bar, adding extra benefits for digestion and cleansing. The Fleur de Sel bar offers up raw chocolate with three varieties of salt. Himalayan and Fleur de Sel salts provide 92 minerals, aid digestion, intensify deeper elements of cacao’s flavor profile, and play both sweet and salty on your tongue in an exquisitely balance. Salt helps with digestion, is a strong natural antihistamine, and is essential for the prevention of muscle cramps. Fleur de Sel is naturally moist, and so fine it never touches machinery. Pink Himalayan salt comes from deep inside Tibet’s Himalayan Mountains, where it was deposited when the sea covered the area more than 250 million years ago. An elegant treat! PommAcai is a bright, fruity bar that joins pomegranate and Amazonian acai berry with deeply healing raw organic cacao to provide the ultimate rejuvenating chocolate experience. The sweet fruit is tempered by rich cacao and leaves you refreshed and ready to face the world. But Gnosis doesn’t stop there. They offer chocolate bars ranging from Cool Mint to Hazelnut to CocoAlmond to Turmeric to Nutmeg. Even more ~ they make trail mixes, spreads, supplements and elixir beverages. Basically, anything you could want to charm your sweetheart for Valentine’s Day. Try Gnosis – they make superior vegan raw chocolates and other treats; are a small, woman-owned business; and support ethical sourcing for all their ingredients. Ready to buy? Use their maps to find a store near you, or shop online directly from the Gnosis website. Do you like Nerds? Imagine chocolate Nerds. That are good for you. In a cute tin that you could carry in a purse, laptop case or even your pocket. That’s Kakosi Nibbles. 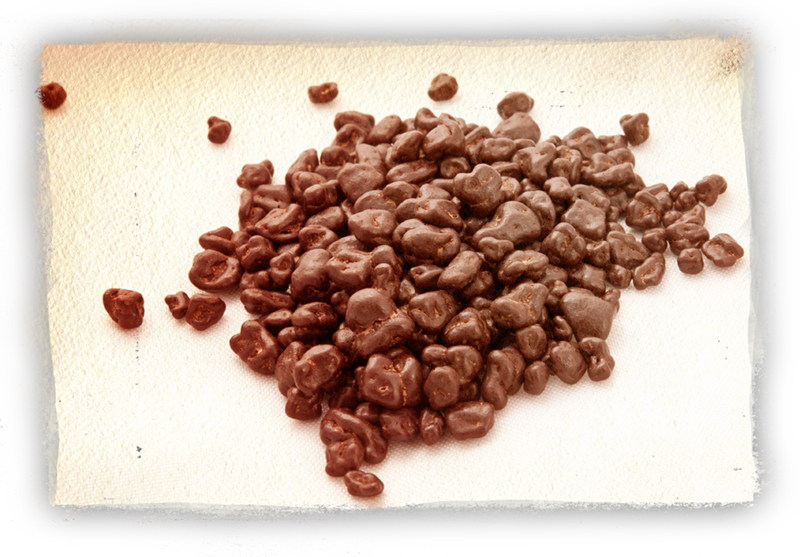 If you like chocolate covered espresso beans you’ll love this alternative. Raw cacao nibs enrobed in dark chocolate are a sweet, tasty and healthy choice. Yes, the middle of these little darlings is 100% cacao and 100% crunchy. A unique chocolate treat! 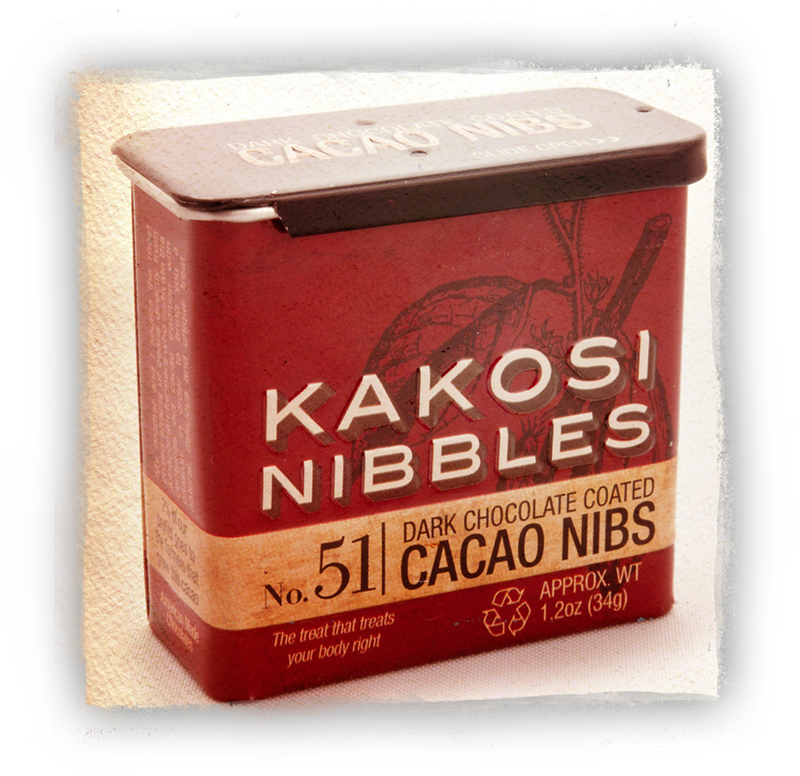 Available in 51% and 71% dark chocolate, Kakosi Nibbles are unadalterated raw cacao. They’ve got antioxidant flavonoids, and magnesium and are sourced by Ameriken Green company, using single-origin organic certified Criollo beans from the forests of Venezuela. The nibs are coated in rich, vegan, organic dark chocolate. Ameriken Green is a cool company, too. They are devoted to fair trade, ethical practices, conservation, recycling/recyclable packaging, community sharing and hand crafted goods. This would be a great little Valentine for folks you share a cubicle with, your siblings, teen-age or college friends, or just anyone who you want to share a little, you know, nibble of chocolate with. Want to find Kakosi Nibbles? Kakosi Nibbles has an online locator map. Type in your city and find the yumminess. We picked ours up at a local coffee shop, where it was in a display by the counter. Try online too – we found several independent companies were offering these tiny chocolates. We tested out the Divine Chocolate and Benjamint Crunch. Both dark chocolate varieties were smooth and tasty. Definitely a thumbs-up for Valentine’s Day. 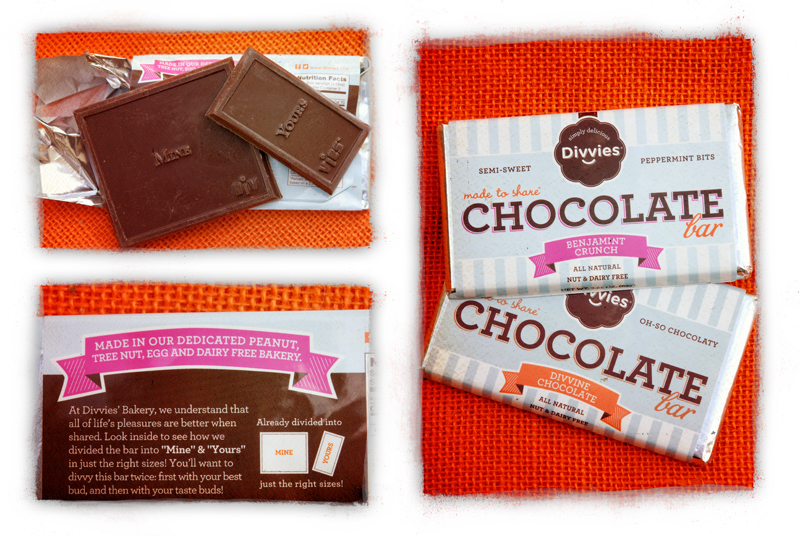 Divvies chocolates are ALL 100% free of nuts, dairy and eggs. So aside from the bars, you even have the option to try chocolate hearts, a chocolate dinosaur and rock candies. Divvies also makes cupcakes, popcorn and cookies – which are vegan. If you want to find Divvies, use their store locator to see if a Whole Foods or Giant near you has the goods. If not, buy online directly from the company! It’s the week of Valentine’s Day. We’re going all chocolate-all the time. That’s right – we’re going to highlight chocolate every day until we share seven vegan candies you can enjoy this Valentine’s. I mean, is there really a better thing to get from your Valentine? And while chocolate can certainly be romantic, you can share chocolate with a friend, neighbor, co-worker, sibling, child – anyone really. It’s just a delectable sweet perfect for any sweetie! 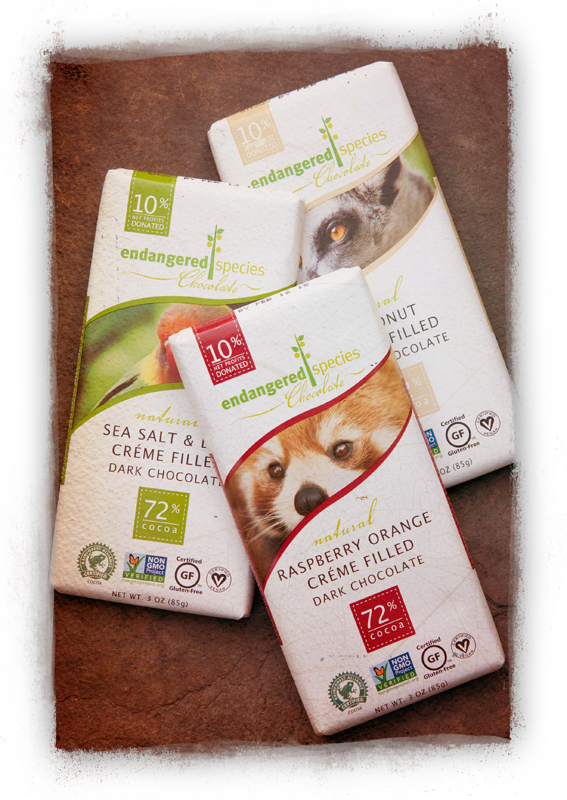 First out of the gate this holiday is a newer offering from Endangered Species Chocolate. We wrote about them before, back in May of 2012, and mentioned many of the company’s awesome attributes, such as how they donate 10% of net profits to support endangered wildlife. 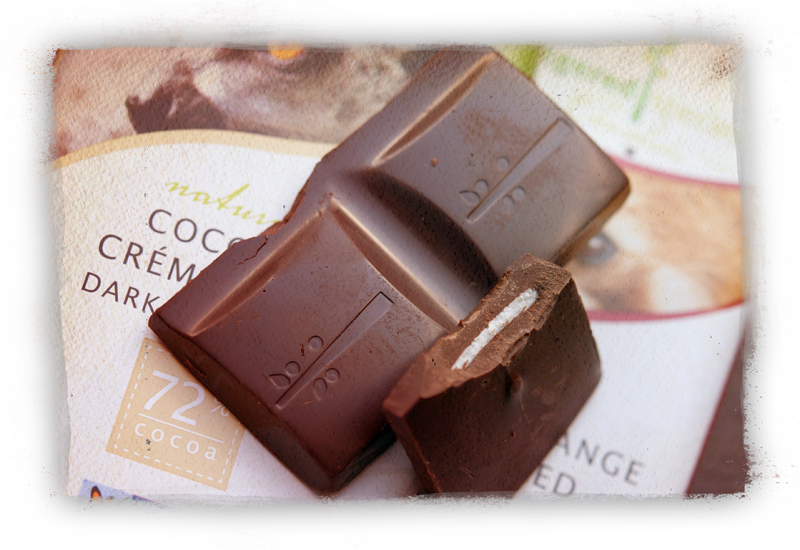 Their chocolate is also Rainforest Alliance Certified, Non-GMO, ethically traded and gluten free. And now, they are offering a line of creme-filled bars. Yes. You are seeing correctly – vegan creme-filled dark chocolate bars. These heavenly bites come in a variety of flavors: Sea Salt & Lime, Almond Butter, Coconut, Blueberry Vanilla, Orange Raspberry and Lavender Mint. We have thus far only found the Filled bars at Whole Foods, Vitamin Shoppes, and other natural foods stores. You can also get them online from Amazon.com The DH and I, as well as a few friends, sampled three of the filled Endangered Species bars. The chocolate is smooth and lush, and melts evenly with each bite. The creme filling isn’t gooey, like the Easter candy you grew up with, but the soft texture compliments the richness of the chocolate and combines in your mouth perfectly. And after all, if you can help animals AND eat chocolate, that seems like a pretty great combination for any Valentine!